Can't attend? Follow WSPACE KL to know of future events! 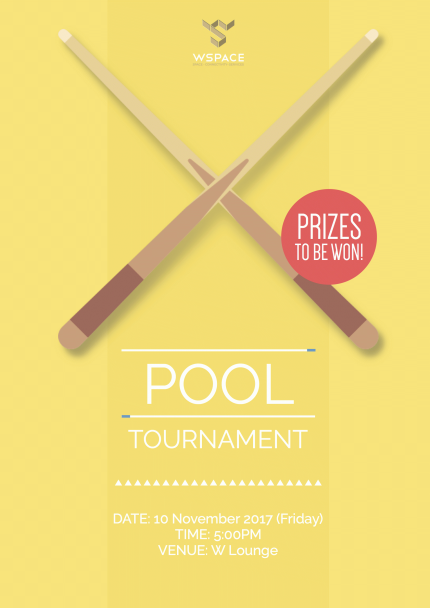 We are challenging all WSPACE members to a round Pool Tournament! Compete against other associates within the community and stand a chance to win attractive prizes! This is a great opportunity to get to know the community as everyone will have the chance to compete against all other participants. We have placed a SIGN UP SHEET at W Lounge right in front of the vending machines for registration, interested parties kindly provide your name, company and email. registrations will be closed on 3 November 2017 (Fri) for advanced preparation.